The head angle is perfect. 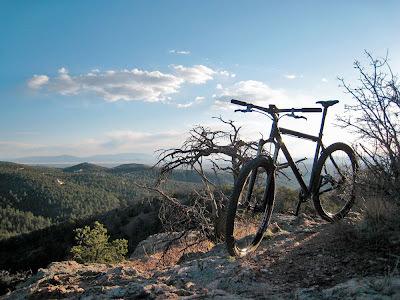 The trails out here (Santa Fe, NM) have dried up and are hard as concrete. They are very fast right now. The Chocolate Revolver SS descends like its on rails. I know that's an overused quote but it's true in this instance. I have only ridden it four times but it feels like a year. The slacker head angle maybe slowed it down just a touch in really tight switchbacks but thats a tradeoff I'm willing to make. The geometry in conjunction with the Reba's Maxel light make for a very stable platform. Not twitchy at all, just point and shoot. Me likey!